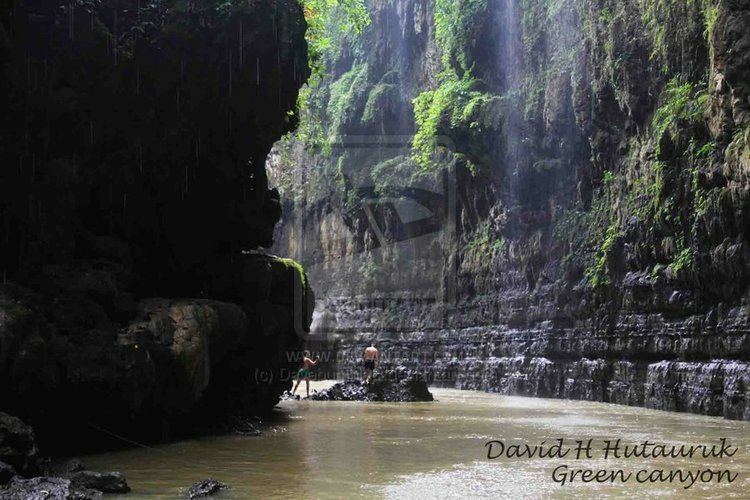 West Java (Indonesian: Jawa Barat, abbreviated as "Jabar", Sundanese: ᮏᮝ ᮊᮥᮜᮧᮔ᮪) is a province of Indonesia. It is located in the western part of the island of Java and its capital and largest urban center is Bandung, although much of its population in the northwest corner of the province live in areas suburban to the even larger urban area of Jakarta, even though that city itself lies outside the administrative province. The province's population is 46.3 million (in 2014) and it is the most populous and most densely populated of Indonesia's provinces. The central areas of Bogor, a city in West Java, has one of the highest population density worldwide, while Bekasi and Depok are respectively the 7th and 10th most populated suburbs in the world (Tangerang in adjacent Banten province is the 9th); in 2014 Bekasi had 2,510,951 and Depok 1,869,681 inhabitants. All these cities are suburban to Jakarta. One of the earliest known recorded history in Indonesia is from the former Tarumanagara kingdom, where seven fourth century stones are inscribed in Wengi letters (used in the Indian Pallava period) and in Sanskrit describing the kings of the kingdom Tarumanagara. Records of Tarumanegara's administration lasted until the sixth century, which coincides with the attack of Srivijaya, as stated in the Kota Kapur inscription (AD 686). An Ulama, Sunan Gunung Jati, settled in Cirebon, with the intention of spreading the word of Islam in the pagan town. In the meantime, the Sultanate of Demak in central Java grew to an immediate threat against the Sunda kingdom. To defend against the threat, Prabu Surawisesa Jayaperkosa signed a treaty (known as the Luso-Sundanese Treaty) with the Portuguese in 1512. In return, the Portuguese were granted an accession to build fortresses and warehouses in the area, as well as form trading agreements with the kingdom. This first international treaty of West Java with the Europeans was commemorated by the placement of the Padrao stone monument at the bank of the Ciliwung River in 1522. 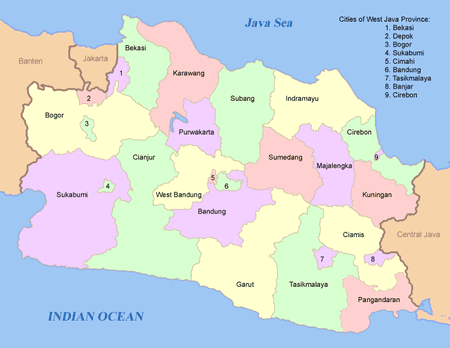 Since the creation of West Bandung Regency in 2008, the Province of West Java has been subdivided into 9 cities (Indonesian: Kota) and 17 regencies (Indonesian: Kabupaten). These 26 cities and regencies are divided into 620 districts (Indonesian: Kecamatan), which comprise 1,576 urban villages (Indonesian: Kelurahan) and 4,301 rural villages (Indonesian: Desa). An 18th regency was formed in October 2012 - Pangandaran Regency - from the southern half of Ciamis Regency; and on 25 October 2013 the Indonesian House of Representatives (DPR) began reviewing draft laws on the establishment of 57 prospective regencies (and 8 new provinces), including a further three regencies in West Java - South Garut (Garut Selatan), North Sukabumi (Sukabumi Utara) and West Bogor (Bogor Barat) - but none of these three new regencies are shown separately on the map below, nor in the following table. West Java borders Jakarta and Banten province to the west, and Central Java to the east. To the north is the Java Sea. To the south is the Indian Ocean. 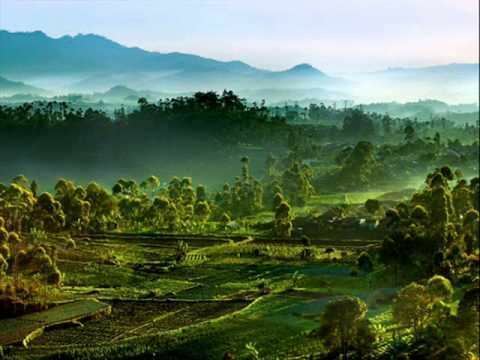 Unlike most other provinces in Indonesia which have their capitals in coastal areas, the provincial capital, Bandung, is located in the mountainous area in the centre of the province. Banten Province was formerly part of West Java Province but was created a separate province in 2000. West Java, in the densely populated western third of Java, is home to almost 1 out of every 5 Indonesians. During the Dutch East India Company (VOC) and Dutch East Indies era, West Java fell under Dutch administration centered in Batavia. The Dutch colonial government introduced cash crops such as tea, coffee, and quinine. Since the 18th century, West Java (known as "De Preanger") was known as a productive plantation area, and became integrated with global trade and economy. Services such as transportation and banking were provided to cater for wealthy Dutch plantation owners. 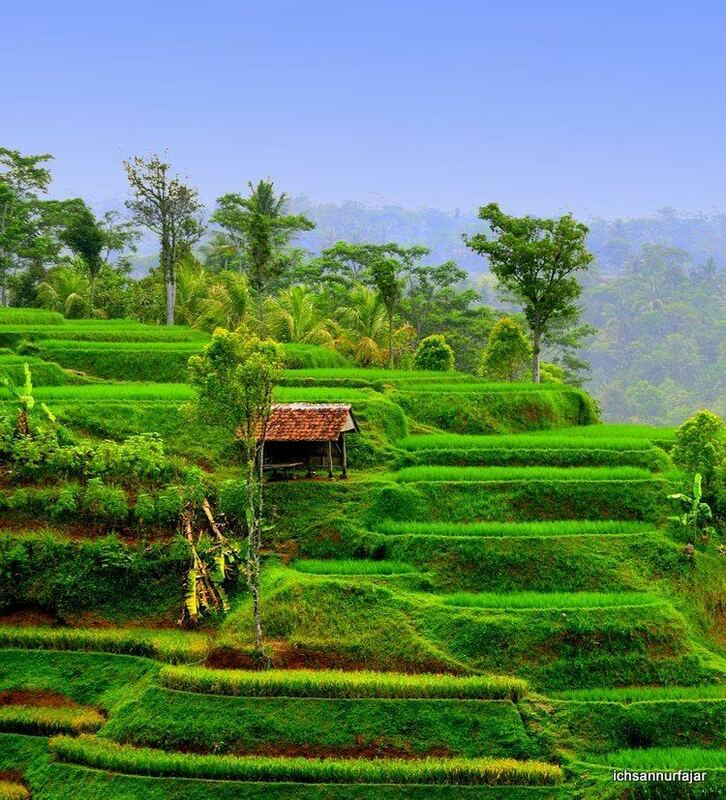 West Java is known as one of the earliest developed regions in the Indonesian archipelago. In the early 20th century, the Dutch colonial government developed infrastructures for economic purposes, especially to support Dutch plantations in the region. Roads and railways were constructed to connect inland plantations area with urban centers such as Bandung and port of Batavia. In addition to Indonesian, the official national language, the other widely spoken language in the province is Sundanese. In some areas near the southern borders with Central Java, Javanese is also spoken. The main language spoken in Cirebon and nearby areas (Majalengka, Indramayu, Sumber) is Cirebonese, a dialect of Javanese with Sundanese influence. Indonesian is widely spoken as a second language. The Sundanese share Java island with the Javanese people and primarily live in West Java. Although the Sundanese live in the same island as the Javanese, their culture is distinct and they likewise consider themselves to live in a separate cultural area called Pasundan or Tatar Sunda. Someone moving from West Java Province to Central or East Java Provinces is literally said to be moving from Sunda to Java worlds. 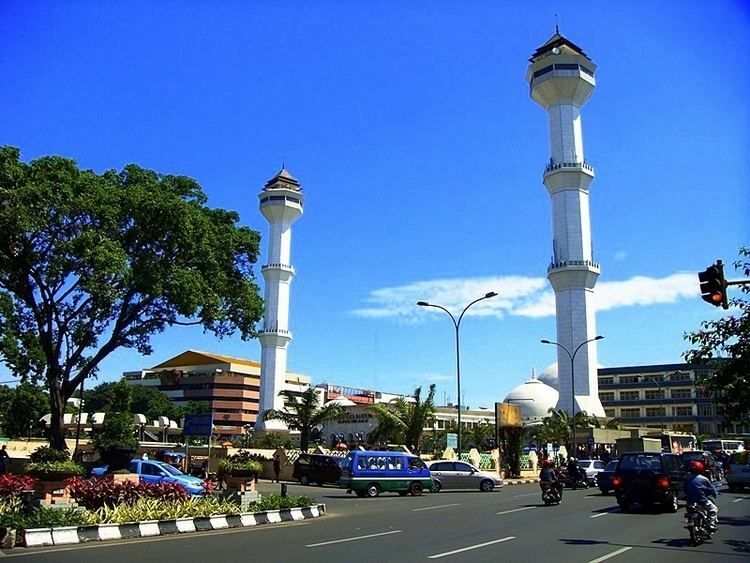 Bandung, the capital city of West Java, is considered as the cultural heartland of Sundanese people. Many indigenous Sundanese artforms were developed in this city. The nearby province of Banten, which was formerly part of West Java before it became its own province, is similar in this regard and is also considered to be part of Pasundan as well. Sundanese dance shows the influence of the many groups that have traded and settled in the area over the centuries, but remains uniquely distinctive, with its variation from graceful to dynamic syncopated drumming patterns, quick wrist flicks, sensual hip movements, and fast shoulder and torso isolations. Jaipongan is probably the most popular traditional social dance of Sundanese people. It can be performed in solo, in group, or in pair. The Tari Merak (Peafowl Dance) is a female dance inspired by the movements of a peafowl and its feathers blended with the classical movements of Sundanese dance. The Tari Merak symbolises the beauty of nature. Nyai Loro Kidul (also spelled Nyi Roro Kidul) is a legendary female spirit or deity, known as the Queen of the Southern Sea of Java (Indian Ocean or Samudra Kidul south of Java island) in Sundanese as well in Javanese mythology. Cities and Regencies in West Java range high to medium Human Development Index (HDI). In addition to completed highways there are some highways that are being built, one of them is Cileunyi–Sumedang–Dawuan (Cisumdawu) with length 60.1 kilometres. Several other proposed toll roads are Soreang–Pasirkoja, Bandung Intra-Urban Toll Road, Ciawi–Sukabumi, Cileunyi–Tasikmalaya, and Jakarta Outer Ring Road 2 (a section of this road has been built). Most cities and towns in West Java are served with narrow-gauge (mainly 1067mm) lines and connected to other provinces on Java Island. A high-speed railway is now under construction, connecting Jakarta and Bandung.